Create your travel agency, lodge, club, blog or destination website the quick and easy way. The GoExplore! 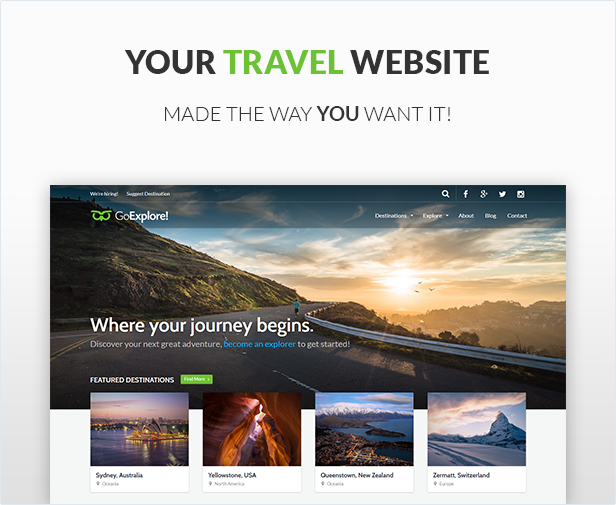 travel HTML template can manage any travel website, from a personal travel blog to a world travel guide book. A destination can be whatever makes sense for your website. If you’re creating a site for a large theme park, the destinations might be the different sections, with rides and activities as the child destinations. A more traditional concept would be a country, region and city relationship, but that’s too easy. Use your creativity!